How would you describe the way Novak played today, especially in the second set? RAFAEL NADAL: Well, I think he played very well in the second. Is difficult to describe. But, anyway, he played better than me. For that reason he is the champion here. So I just can congratulate him. That's the true. He played very, very, very high level for moments, and I played a little bit lower than the previous days. Q. Did his attacking force you to play short? RAFAEL NADAL: No. I played short because I played short I think today. He's doing great. He's doing few things fantastic. But I had to play better to win, and I didn't today. I played little bit less aggressive. And the most important thing, to win in matches here, to win tough matches like today, like two days ago, the most important thing is play well the important moments. There is few points in the match that can change the match, and I didn't today. Q. After a match like this, we can think of many reasons for the outcome. Is it possible that one of them is Novak was able to handle your forehand better than the other players? RAFAEL NADAL: Well, when one player beat you five times is because today my game don't bother him a lot. Today probably against me he's playing better than my level. And find solutions, that's what I have to try and that's what I gonna try. Anyway, seriously, I only lose matches this year against him. That's the true. When I was healthy, I only lost against him. That's the true. The rest of the matches, I don't want to count in Queen's, two days ago two weeks ago, three weeks ago, because is different conditions for me. When I was hundred percent to play, I lost against him five times. The rest of the year I won almost every match. So I'm doing the things very well probably not against him. That's what I have to change. That's what I say: to win these kind of matches, I have to play well these kind of points can change the match. When I had the breakpoint at the first set, at the first game of the fourth set, I didn't play well that point. That was a big moment for me. Because I came back after 6 1, start the fourth with a break can change everything. If not, I gonna be here explaining the sixth. Q. How much of those four finals against Novak affected your confidence? RAFAEL NADAL: I started the match without thinking on that. But that's true. When you arrive to 5 4, these moments probably affects a little bit. That's what happened, and that's why. Q. You've lost to Novak five times this year. RAFAEL NADAL: I know that. We were talking about that (smiling). Q. Why do you think you can't beat him? Do you think there's a psychological reason? 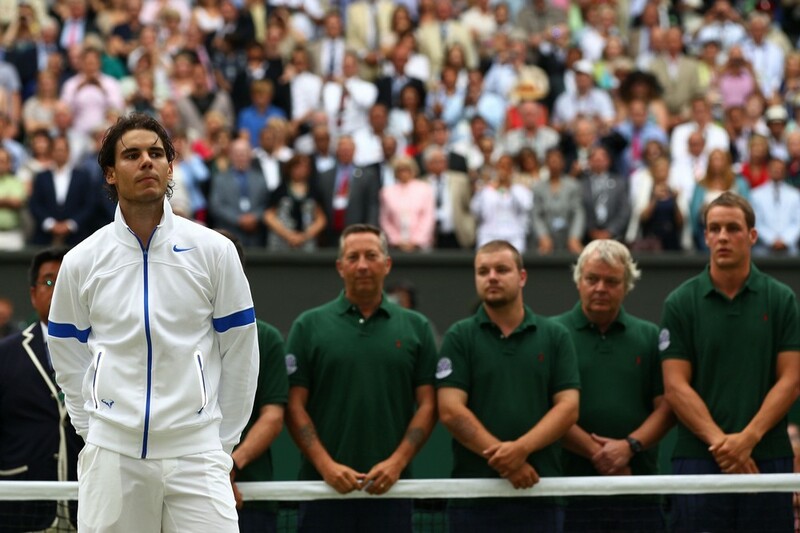 RAFAEL NADAL: You are hear that? I just explained that. Q. Is there a technical reason? Is he handling your topspin forehand better with his two handed backhand, taking it early? RAFAEL NADAL: The game is easy. The game is not that difficult. So think about a lot of things will be a mistake, in my opinion. Don't think is how you playing well, how you not playing that well. Is true we can analyze that my game is not bothering him. We have to find how I can bother him another time. I did in the past. He's in the best moment of his career. That's true, too. I am in one of the best moments of my career. Still not enough for him. I have to play longer. I have to play more aggressive. I have to have less mistakes. Yes, that's what I have to do. But start to think if his backhand or he takes the ball earlier, yeah, he's very complete player. He has good backhand, very good forehand, good serve. His movements probably are one of the best in of the world in this moment. Seriously, I lose because I am playing against the best player of the moment, the best player of the world tomorrow, and I am the second. And when you play against these players and they are playing unbelievable, the normal thing is lose. That's what happened last few times. My experience says this level is not forever. Even for me when I was last year winning three Grand Slams, my level of last year is not forever. Probably the level of Novak of today is not forever. I gonna be here fighting all the time, waiting my moment. I don't have to wait a lot, because I already won three tournaments this year and one Grand Slam. But waiting my moment to beat him another time. I understand the sport like this. When one player is better than you, at this moment the only thing you can do is work, try to find solutions, and try to wait a little bit for your time. Last five times wasn't my time. I gonna wait and I gonna try to a sixth. And if the sixth doesn't happen, to the seventh. It's going to be like this. That's the spirit of the sport. Q. Emotionally, is this the most difficult defeat of your career? RAFAEL NADAL: For sure not. C'mon. RAFAEL NADAL: Is difficult to say now. You know, after playing eight finals this year, winning Roland Garros few weeks ago, play the final here cannot be the toughest lose of my career. You know how is the toughest moment? When I am in Australia and I finish the match and I am injury; when in 2010 I have to go out of Australia with an injury, That is the toughest moment. That's the game: sometimes you win; sometimes you lose. Three weeks ago I was winning in Roland Garros; today I was playing the final here and I lost. That's the sport. We started 128 players. One have to win. I was the second. Is a good result for me. For sure always the goals and the objective probably is win every time, but everybody lose. Nobody's winning everything. But he going to lose in the future. I going to keep losing a lot of matches in the future. I gonna try my best in every moment. But for sure this is not the toughest loss in my career.